· Connects to Media NAS via a single USB3.0 cable. PerfectSTOR is the best way to quickly and inexpensively expand storage on your USB3.0-ready PerfectNAS media system! Order the unit complete with drives, and Perfect Home Theater will provide a complete, turn-key service to enable and set up your new drives! Looking to add in your own / existing drives? Not a problem - the turn-key service is always available as a separate service add-on if you'd like to add in your own hard drives! Why Choose PerfectSTOR over conventional NAS / external storage arrays? Convenience, reliability, and ease of use are the key focus on Perfect Home Theater systems, and with the PerfectSTOR, we can guarantee all three. PerfectSTOR is fully tested and guaranteed compatible with select Perfect Home Theater systems, so there's no doubt as to how it'll perform. On the other hand, third-party NAS units / off board storage would require additional configurations, tweaks, and advanced networking knowledge for proper integration. PerfectSTOR eliminates all these questions and provides a turn-key solution - making it easy and simple to expand storage and enjoy the system! Simply connect the included USB3.0 cables between the PerfectSTOR and your compatible PHT system, connect the power cable, turn it on, and then send us an email for service! (Yes, it's that simple!) A technician will remotely log into the system, and set up the PerfectSTOR for you. There's no advanced networking, permissions, or shares you need to set up. PHT 's "white glove" concierge service will take care of it all! Can I add my own hard drives? Yes, you can do so if you wish. Note that when PerfectSTOR is set up with non-VidaBox supplied hard drives, support is strictly restricted to the chassis hardware itself. Any assistance on drive setup - including, but not limited to, creation and configuration of network shares and properly setting up permissions - must be provided by the drive manufacturer. Alternatively, one can add PHT 's optional "white glove" / concierge service (at a flat-rate cost per drive), and we will integrate the self-purchased drives via remote login services. PerfectSTOR ships empty, and can support up to (5) 10TB drives onboard for a total of 50TB usable space! For convenience & simplicity, order needed drive upgrades here, which include our "white glove," turn-key set up service! No need to waste time with screw drivers - PerfectSTOR is designed for a Tool-free installation. Simply slide out the tray, and secure the drive with spring loaded clips in mere seconds! 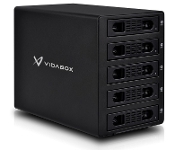 When a PerfectSTOR is ordered with VidaBox hard drives included, we will provide remote login service to set everything up on the PerfectSTOR for you! No need to learn about creating shares, setting up permissions, or tweaking settings. Saves time and headaches! Add Your Own Storage with Our "White Glove" / Concierge Service! Easy to connect - just (2) wires! Set up doesn't get any simpler - just connect the included USB3.0 & power cables, install the drives - and we're all set! We can take care of the rest with our optional "White Glove" / turn-key service! PerfectSTOR blends beautifully into any environment with its fine, black anodized aluminium finish! Perfect for high-end set ups! Emitting less than 30dBA of noise at 1m, the PerfectSTOR can be placed in any environment, and not disturb the viewing or listening experience! After extended period of non-use, PerfectSTOR powers its internal drives down to minimize wear and tear, and to help lower your electric bill. Drives will automatically spin back up as needed as playback of music & movies is started! Unlike previous generation, USB2.0-based external storage devices, PerfectSTOR can easily stream up to 10+ AV streams effortlessly, complete with true 2160p + 11.1 surround sound! * - Perfect Home Theater support services, warranties, and performance guarantees do not apply to units with self-supplied drives. No phone or email support is available for self-installed drives. Additional documentation may or may not be available; all support for self-provided drives are provided solely by the hard drive manufacturer or point-of-sale only, unless "White-Glove" service is purchased.